Will physically locates Baseball's sense of continuity in the old ballpark. It is the receptacle of memories for an institution consumed by its connections to the past. According to Time's Steve Wulf, the old parks that endure -- Wrigley Field, Fenway Park, and Yankee Stadium -- are, "baseball's Librarie of Alexandria, the repositories for its greatest treasures. The memories, which distinguish baseball from every other American sport, are the reasons we can't give up the game even after it abandons us. "3 The ballparks translate the sentimental and emotional values of the game to the physical realm. For a game which, in the words of Doris Kearns Goodwin, "allows us to feel connected to a place,"4 the ballpark is both the physical and imaginative location of that place. How could a new ballpark have been injected with history before even hosting a game? How could a new park be a "natural part of the cityscape?" How could a new park, hitherto unplayed in, be "definitely familiar" without a "blur" of memories? One way the park seemed familiar and historical was through its allusion to older parks of the concrete and steel era. Comparisons to these parks were seemingly endless: "Left field. . . is a homage to Yankee Stadium's most memorable features"15; "center field is an obvious nod to Wrigley"16; "right field is pure Ebbets Field"17; "the asymmetrical playing field contains nooks and crannies in the outfield that will make playing defense there a thoughful and artful vocation, in the mold of trying to learn all the angles at Boston's Fenway Park"18; "to most, the huge brick B&O Warehouse provided the park's signature touch, looming large behind a sign-festooned right field fence reminiscent of Ebbets Field's"19; "people watching from building roofs in the city reminded many, of Chicago fans peering into Cubs' games from neighborhood rooftops"20; "maybe the gray chilly skies took the glint off the fresh dark green paint on every wall, making it seem weathered like the upper decks of old Comiskey Park and Wrigley Field. "21 In some ways, Camden seems a Rorschach test for ballpark enthusiasts. Yet, in spite of its allusive nature, Eli Jacobs maintained that it was "very important that the park have a personality, an identity, so people could say, 'This is Baltimore's baseball park,' and if you're in it you have no doubt where you are. "22 The park's classical archways, wrought-iron scrollwork, gates, and light stanchions, Oriole-shaped weather vanes, old-time band, ushers in tam o'shanters, and "Baltimore Baseball Club" logos from the 1890s on the ends of seat rows suggest the considerable effort and detail involved in creating an air of pastness. Columnist Tony Kornheiser predicted, "It's the warehouse in right field, with its sandblasted brick and its pre-gentrification look that gives the place character. It's the warehouse that will grow the legends of Camden Yards, when the first balls are hit off its face. "23 Cyrus Patell similarly anticipated the history Camden's future has to offer: "With its natural grass, its asymmetrical dimensions, and its integration into an urban context, Oriole Park at Camden Yards is a glimpse into a future in which owners, players, and fans work together to realize something close to [former Commissioner A. Bartlett] Giamatti's vision. If baseball is to prosper and grow during the next century, it must continue to provide us with the moments that myth are made of. "24 Park designers labored to create a mythical-historical atmosophere, as spectators are greeted by a statue of Babe Ruth (a Baltimorean, though he only played for the Orioles, at that time a minor league team, for a few months) at the gate, and encounter markers denoting home runs hit onto Eutaw Street -- "the moments myth are made of" -- as they file to their seats. In Travels in Hyper Reality, Umberto Eco wrote of theme parks, "the ideology of this America wants to establish reassurance through imitation. "25 Camden Yards was certainly created in the image of the old parks, and its reception indicates that visitors read it as an amalgamation of different parks, "a Frankenstein of grafted impressions. 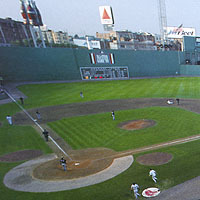 "26 The park's asymmetrical outfield dimensions -- "a little quirky, in the best sense,"27 according to Jacobs -- is often cited as both an example of its individuality and its debt to the older parks; they make Camden both like Fenway and unique. What is remarkable is not that the dimensions are asymmetrical, but that their asymmetry is so emphasized by the park's proponents. In many ways, Camden simply provides a mediated old ballpark experience -- a simulated trip to Fenway or Wrigley, or better yet, to no-longer existent parks like Ebbets Field. The present is packaged as a past cleansed of ugliness and discomfort. Camden's Eutaw Street simulates Yawkey Way in the Fens, but is within the ticket gates; it is a simulacrum of urban activity, restricted to those within the fence. The park then sits not "naturally" within the city as Jacobs claims, but perhaps it feels as though it does. Daniel Rosenweig argued that Camden Yards "promised patrons the ability to renounce the present in favor of virtual access to a richer, somehow more authentic past. "28 These "new-old" ballparks are certainly not designed for the discerning historian or archeologist, but persons willing to experience a pastness couched in comfort. It is a past even better than the real thing. Creating a generic past for public consumption undermines the individuality proponents of Camden Yards claim for the park. "The new ballparks then fall under the same criticism as their predecessors, the concrete doughnuts: they all look the same." When Bart Giamatti saw a model of Camden Yards in 1989, he predicted, "When this park is complete, every team will want one. . . . Baseball can be like life -- the keys to the future often lie in the past. "31 The retro ballparks (ten have been constructed since Camden Yards) in many ways succeed as functional baseball venues -- in ways that many of the parks before them failed. The proximity of fans to the game, the orientation of seats to the field of play, the revival of natural grass surfaces, and the placement of parks in urban settings are all functional characteristics of older, revered parks like Fenway and Wrigley. In this sense, Giamatti's suggestion is apt -- the functionality of ballparks in recent years has improved as designers sought a pre-stadium precedent. However, the surfaces of parks press beyond functionality to orchestrated aura. Whereas these past functional successes highlighted the game on the field, themed pastness transfers attention from the game to the park itself. With the advent of more and more services at games -- including features like Comerica Park's carousel and ferris wheel -- the park, not the game, becomes the product. Coupled with nostalgic impulses, the new parks can seem cartoonish representations of the past. 1 Mark Maske, "Camden Yards Packs in Full Season of Memories," Washington Post 29 September 1992: E5. 2 George Will, Bunts: Curt Flood, Camden Yards, Pete Rose and Other Reflections on Baseball (New York: Scribner, 1998) 240. 3 Steve Wulf, "This Property Condemned," Time May 13, 1996: 80. 4 Baseball, part nine, dir. Ken Burns, Florentine Films, 1994. 5 Alan Schwarz, "Ballpark," American Heritage May 1999: 44. 6 Baseball, part nine, dir. Ken Burns, Florentine Films, 1994. 7 David John Kammer, "Take Me Out to the Ballgame: American Cultural Values as Reflected in the Architectural Evolution and Criticism of the Modern Baseball Stadium," diss., University of New Mexico, 1982, 317. 8 Mark Starr, "Take Me Out to the Ballpark," Newsweek April 11, 1994: 82. 9 William Gildea, "Friendly and Familiar Confines," Washington Post 12 April 1992: D10. 10 William Gildea, "Finally, a Ballgame For Camden Yards," Washington Post 3 April 1992: F1. 11 Thomas Boswell, "Now That's the Way to Build a Ballpark," Washington Post 4 April 1992: H1. 18 Mark Maske, "For Players, Park Will Need Figuring," Washington Post 31 March 1992: E4. 19 William Gildea, "It's a Grand Opening for Camden Yards," Washington Post 7 April 1992: A9. 23 Tony Kornheiser, "The Park and the Devils: Good for What Ails Us," Washington Post 8 April 1992: F1. 25 Umberto Eco, Travels in Hyper Reality, trans. William Weaver (New York: Harcourt, Brace and Co., 1990) 57. 26 Tom Callahan, "One Bronx Cheer for the Yards," Washington Post 19 April 1992: D3. 27 Mark Potts, "It's Built, the People Will Come -- but Questions Linger," Washington Post 8 March 1992: D4. 28 Daniel H. Rosenweig, "Retro Accents and Carnival Pleasures: The Cultural Role of the Ballpark in the Renewing American City," diss. University of Virginia, 1999, 7. 29 Peter Richmond, "Playing Hardball," Architecture November 1998: 132. 31 Curt Smith, "Comeback!," The American Enterprise March-April 1997: 52. 32 Stan Grossfeld and Dan Shaughnessy, Fenway (Boston: Houghton-Mifflin Co., 1999) 139. #1 Stan Grossfeld and Dan Shaughnessy, Fenway (Boston: Houghton-Mifflin Co., 1999) 6. #3 Orioles Magazine 2nd ed. 2001: 97. #8 Dan Gutman, The Way Baseball Works (New York: Simon and Schuster, 1996) 151. #1 Baseball, part nine, dir. Ken Burns, Florentine Films, 1994. #2 Baseball, part eight, dir. Ken Burns, Florentine Films, 1994.